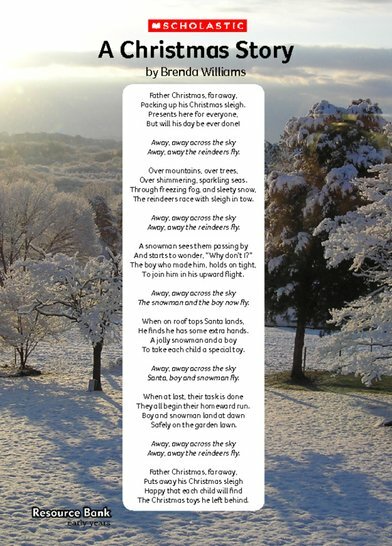 The poem, ‘A Christmas story’, was inspired by Raymond Briggs’ two most famous children’s books, Father Christmas and The Snowman. It aims to recreate the magic and wonder of both stories by bringing the characters together in their enchanting flights across wintry skies as they deliver Christmas toys. Read the poem aloud. Explain that the poem is telling a story. Like all stories, it has a beginning, with Father Christmas loading up his sleigh, a middle, where the snowman and the boy join him to help deliver the presents, and an ending, where they all return home.